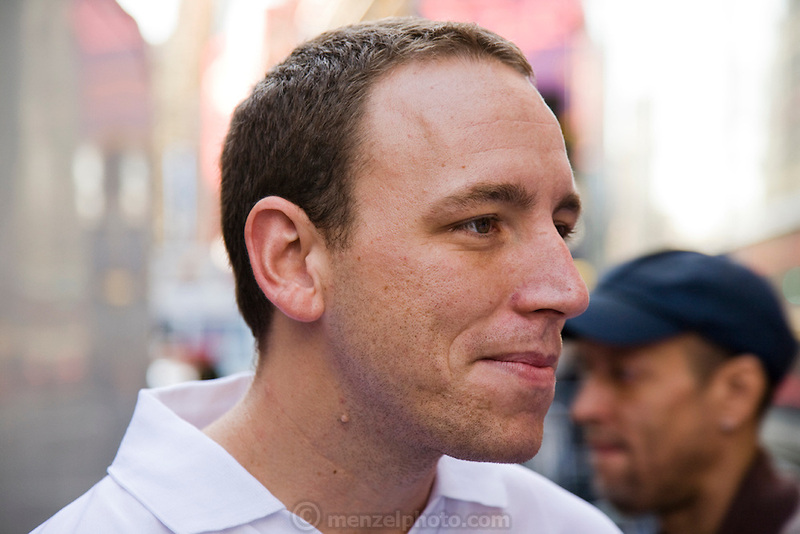 Competitive eater Joey Chestnut, who the first prize of $5,000 in the Famous Famiglia world championship pizza eating contest in New York City's Times Square by eating 45 slices of cheese pizza in 10 minutes. (Joey Chestnut is featured in the book What I Eat: Around the World in 80 Diets.) Each slice weighed 109 grams (3.84 ounces) (3.84 ounces) and contained 260 calories. In ten minutes Joey consumed 10.81 pounds (4.9 kilograms) of pizza and drank a gallon of water. The pizza contained 11,700 calories. MODEL RELEASED.